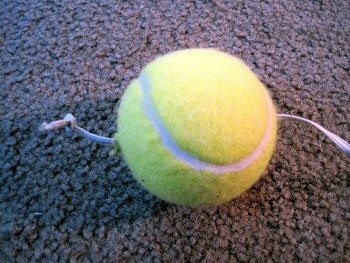 In a recent post, I shared a few links that showed an inexpensive hand-eye coordination tool that required nothing more than a tennis ball, an elastic cord, and a hat (original entry here).Â Since posting those video clips, I’ve received several questions about making one of these inexpensive tools.Â Many readers had trouble finding the necessary elastic cord and others were unsure how to attach the cord to a ball. Fortunately, I recently made one of these tools for one of my fighters and snapped a few pictures to help clarify some of the confusion. 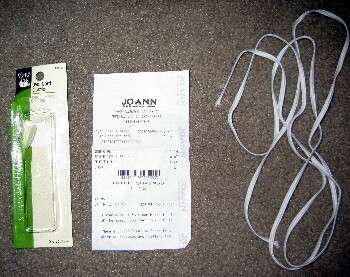 To begin, the elastic cords can be found at most fabric stores. 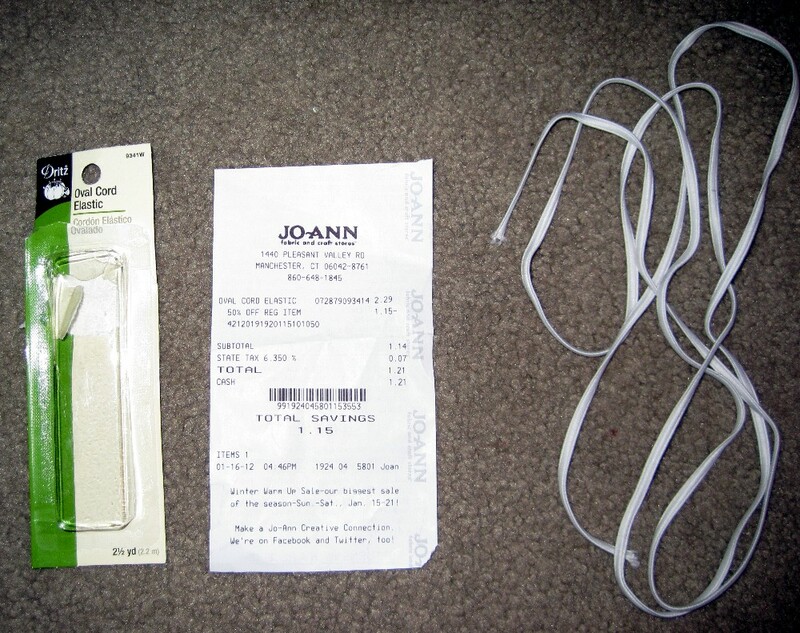 I purchased 2.5 yards of elastic cord from Jo-Ann Fabric & Craft for less than 2 dollars.Â You can click the image below to view a larger picture of the receipt. 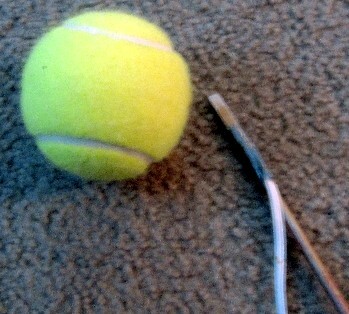 I then used a screwdriver to puncture a hole all the way through the tennis ball (in one side, out the other). You will then remove the screwdriver from the ball.Â Now, you’ll take the elastic cord and attach it to the screwdriver with a thin piece of duct tape. Please note that I chose to attach the cord after making the initial holes just in case it would be too tight for the cord to remain attached to the screwdriver when first puncturing the ball. Once you’ve taped the cord to the screwdriver, you can now drive the screwdriver back through the holes that you already created.Â Push it all the way through again.Â You will then remove the tape to free the cord from the screwdriver.Â Hold on to the cord and pull the screwdriver out of the ball. You will then tie a knot at the end of the cord to prevent it from slipping back through the hole. Pull the long side of the cord back until the knot stops it and you are ready to go.Â All that you’ll need to do is attach the cord to a hat. As for ideal lengths, start conservative as once the cord is cut, you can’t reattach it.Â Different cords will have different amounts of stretch so it is impossible to provide a universal recommendation regarding length.Â Typically, the tennis ball will hang down just above waist level, but a few inches in either direction can make a big difference in terms of speed.Â Experiment with a few different lengths and choose something that works well for you. I happen to have 40 inches of stretch-rite elastic chord thats been sitting for at least 3 years. I’ll try this out. i had asked about how to attach the cord and this VERY clearly illustrates it. i’ll be making one of these asap! Just came across your website was recommended by Don’t Sleep fitness. Look forward to being a regular visitor. Thanks for sharing. But you should really consider marketing this as the “Hand-eye Coordinating X-treme” and you could probably even ask for three easy payments of $49.95, with a special gift of a second one for free? I’m just saying…. Love this idea and i love arts and crafts! I’ll be making 2 of these-one for me, one for the boyfriend! im not a boxer but am having real fun using this homemade contraption. After browsing through the forum a bit, I have noticed that people punch from their first two knuckles. Does it really matter where you punch from when hitting this tennis ball? Reason I ask is because my knuckles are REALLY sore after I hit the tennis ball. Thanks, Ross. Made this last night. It’s been incredible and I can’t put it away. I threaten my girlfriend that I’m taking it running with me though the neighborhood. My cord keeps getting twisted. A style thing or have I done something wrong? Hello do you sell the mini double end? I search a double combination of boxing and kicking in one construction! I mean one rope 2 balls. Hi Ross, I love your website – have previously made a sandbag following your instructions and today made this tennis ball reaction trainer. Both worked superbly. 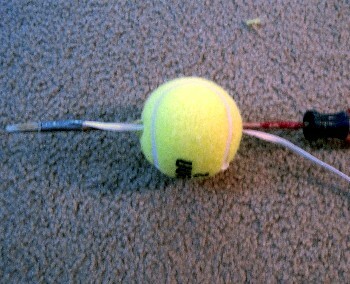 I’m addicted to the tennis ball and my kids love it too… simple and effective, as all training equipment should be. 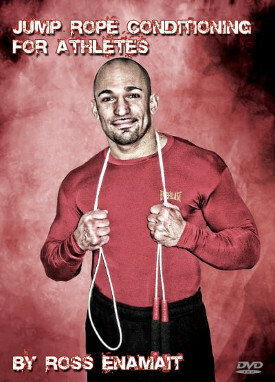 Going to make a few and introduce them to my kickboxing classes, both kids and adults! cool idea for building a cheap reaction Trainer. This could also be a good idea for my soccer-Team for Training theire reaction. Thanks and go on with such nice articles. It’s hard to tell- is that 1/8 or 1/4 inch wide elastic?